What is in store for Joe Hughes and his family? Has The A Word TV show been cancelled or renewed for a third season on SundanceTV? The television vulture is watching all the latest cancellation and renewal news, so this page is the place to track the status of The A Word, season three. Bookmark it, or subscribe for the latest updates. Remember, the television vulture is watching your shows. Are you? 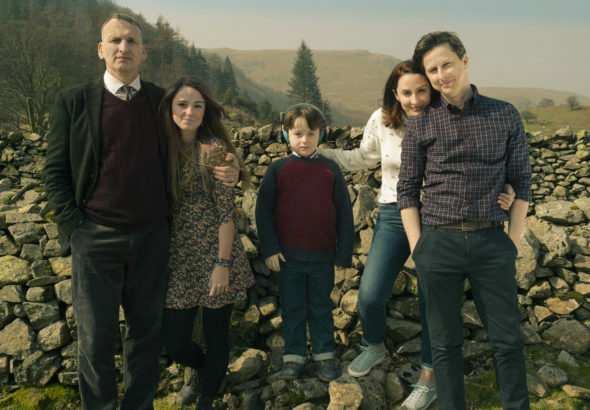 Airing on the SundanceTV cable channel, The A Word stars Max Vento, Lee Ingleby, Morven Christie, Vinette Robinson, Greg McHugh, Adam Wittek, Tommie Grabiec, Molly Wright, Pooky Quesnel, and Christopher Eccleston. When five-year-old Joe Hughes (Vento) is diagnosed with Autism Spectrum Disorder, feelings bubble to the surface which only serve to highlight the tensions between his family members. Now they must connect with one another, even as they learn to give Joe what he needs. As of April 23, 2019, The A Word has not been cancelled or renewed for a third season. Stay tuned for further updates. We don’t track ratings for Sundance TV shows, so it is hard to predict whether they will cancel or renew The A Word for season three. On top of that, this dysfunctional family drama is a BBC One series, so the BBC has to commission a third series (i.e. season), in order for SundanceTV to consider renewal. My gut says if the BBC renews it, Sundance will, too. Because that’s just a guess though, I’ll keep an eye on the trades and update this page with breaking developments. Subscribe for free alerts on The A Word cancellation or renewal news. Review the ratings for broadcast network TV shows. Find more of The A Word TV series news or other SundanceTV TV show news. What do you think? Should SundanceTV renew The A Word TV show for a third season? How would you feel if they cancelled this TV series, instead? Really hoping for another season!! The show is well written and gives a light-hearted and entertaining view of life with a developmentally challenged person. Please renew, I have an autistic grandson and this show is so realistic, human and true and healing for those of us living with ASD in the family. Please renew! I would so enjoy another season – please consider it . I have loved the characters, settig and continuing story development…… leaves me questing for more laughs, tears and hopes for things to’settle’ down for this very human family. Renew!!!!!! This is a excellent show! You are pulled into the characters lives dealing with every day life and their families. While you are entertained by the fine acting, you also get a peek inside a family with an Autistic child without being preached at. Having a child on the Autism spectrum I can say this is a good representation of reality. It’s a good mix of entertainment and education. PLEASE renew this show, I look forward to other seasons. Please come back for season 3!!!!!! I love the A Word hope third season !! Please continue this excellent series. My 3 great-grandchildren, all siblings, ages 11, 4 and almost 3 have been diagnosed and are on the spectrum. The show has given our entire family invaluable insights into the illness. Thank you. This is a riveting television show and addresses a little talked about illness in our society. Plus the stress to families coping or not is well worth thinking about. The acting is great, story lines interesting and we never miss an episode. Hope to see this series continue for as long as they have something to say. Please continue The A Word. It’s a ibeautiful show. The actors are wonderful, the stories and characters are so relatable. As trying as it can be, everyone should have a Joe in their lives. This is a excellent show. First because it is entertaining. Secondly because it shows what life is like with an Autistic child. Please renew this show, I look forward to another season. This is a beautiful show. I wish more were like it out there in this all too rushed world around us!!!! Please please please renew this show all of my friends and family watch it and appreciate it more than words could ever explain. Thank you!